No, no, no. Not out of an airplane. (That's my friend Mindy and her husband Jim in the photo, not me! Good Lord, I have enough trouble with nerves inside an airplane!) I'm speaking metaphorically. You see, I made a big personal leap of faith, jumping feet first into the unknown. I resigned from my full-time job to pursue my gardening dreams! For the last six years, I've been fitting teaching, presenting, and writing about gardening, as well as garden coaching and hands-on client gardening, around my day job. It hasn't been easy, but it was the only way to pursue my life's passion. I've been plotting and scheming, saving and planning, a long while now. So 2009 is my personal year of change, as well as that of a nation, and I look forward to my new life. It's scary (oh yes!) but exciting but frightening but invigorating... a roller coaster of emotions daily (or hourly, depending). So how did I get here? How did a risk-averse, practical, not 21-year-old single woman decide to give herself a year's "sabbatical" (or "gap year" if you like) to follow her own dreams? The short answer is, it took a long time. In two major ways, my journey is about loss, but in a hundred little ways it's so much about what I've gained. The long answer is below. I hope you will indulge my thoughts today, as I both look to the future and reminisce about my journey. I've been earning my living as a marketing and technical communications professional my entire adult life. And I've been thinking about work and life and happiness, and how sometimes earning a living conflicts with getting to follow one's true passion, since April, 1997. That's when my dad died. He was 59 and never got to retire. A lifelong hard-worker, he moved from his homeland of Austria to Switzerland to Australia to Germany to the U.S., always seeking the next and better job. We never talked about it directly, but I know his career wasn't everything he had hoped it might be, and I know he spent his life searching. I don't know what he was looking for exactly, and I'm not sure he did either, but I don't think he ever did find it. I am very much my father's daughter. I too had been searching, without even realizing it, and I didn't know exactly what for, either. I did know I wanted to retire some day, and I knew I wanted to not only find my "something" but to grab it with both hands, pinch its cheeks, and give it a big kiss like I was its Aunt Mabel! I also knew there are no guarantees. Things went on normally for years, but I spent a lot of time thinking about how my life might be different. As time passed, I became stronger and found the courage to accept things I knew were true even though I didn't want them to be, and to admit things were false even though I wanted to keep pretending. I became divorced in late 2001. In spring of 2002, when I was working part-time based on another life plan that didn't pan out, I needed to supplement my income. On a whim, I designed some flyers for my gardening services and distributed them in the higher-income neighborhoods in town. I was overwhelmed by responses, eventually getting referrals from clients of clients and so on. I enjoyed the work, everything from mucky one-time spring cleanups to weekly upkeep to designing small garden beds. The ironic thing is, I know I never would have started a gardening business had I remained married. Not only wouldn't I have needed the money, but it never would have occurred to me that I knew enough to work for others. It turned out to be both a wonderful learning experience and an unexpected reinforcement of my abilities. In 2003, I decided to volunteer at "for The Love of Cats" (TLC), a no-kill cat shelter/cat retirement community operating out of a barn and restored farmhouse. My intention was to help with cat care, but it turned out shifts were specific hours on specific days, and my schedule didn't allow that. I did notice the backyard had a nice deck and a fenced in area, complete with sidewalk and resplendent in weeds. So I volunteered in another way. I researched, designed, planted, and maintained a garden for the cats to enjoy, with plants especially attractive to them. The thing is, I never would have felt comfortable designing a garden of this size had I not "gotten my feet wet" with my gardening client work. TLC's owner, Kitty Zimmer, was always supportive of my efforts and the experience remains my favorite volunteer activity. Kitty also wanted others to know about what I was doing in the garden, and asked me to give a talk to the rest of the volunteers. Um, what? Oh, I knew my way around PowerPoint no problem, and I enjoy organizing information and photos. But let's just say I didn't do particularly well in my college speech class and had never expected to have to speak publicly again! But I did it anyway as I didn't want to let Kitty down. I was nervous and shaky and sweaty, but to my surprise the talk wasn't a complete disaster. The two subsequent talks Kitty asked me to give went a little better each time. And I no longer equated public speaking with torture. The thing is, I never would have started speaking if I hadn't volunteered at TLC. In 2004, I applied to the Washtenaw County master gardener program. I had investigated the program in 2000 but couldn't get time off work to attend. My part-time schedule allowed it now. My county's MG program is very popular and about twice as many people apply as are accepted. My friend Aunita, who I had met through another volunteer organization, urged me to stress my volunteer experience in my application because the MG program is all about volunteering. I did and I was accepted. I loved the class sessions and I also met another close friend, Carole, through the program. In fact, I've met many wonderful people and worked on many wonderful projects through my participation as a master gardener. Most notably, I was selected to speak at the 2005 International Master Gardener Conference in Saskatoon, Canada. That was my first official presentation. That talk led to others. Soon I was putting together and presenting classes on a wider range of topics. I actually started actively enjoying speaking, and I also began teaching very part-time through Washtenaw Community College's Lifelong Learning program. It was an unexpected joy, and an unexpected skill. It feels very good to end up being good at something you once hated and feared! The thing is, I never would have continued speaking, or made some of my closest friends (What can I say? Gardeners are such wonderful people! ), had I not become a master gardener. In 2006, I presented a program on winter seed sowing at the Michigan MG Conference. My two proctors were so excited about my talk, and a group of gardeners wanted their photo taken with me. (ME! Did they think I was Paul James or something?!?!) One of the proctors suggested I write a book on the topic. I brushed this off. For a while. Then it dawned on me (you'll excuse me but I'm a bit slow sometimes) that I'd been making a living as a writer for such a long time in the corporate world, so why couldn't I write about gardening? To pysch myself up, I phoned Pat Lanza, author of several books on lasagna gardening, who had been the keynote at that conference and who had given out her phone number to would-be authors. She was great to talk with, very encouraging, very practical, very savvy, and very funny. I was enthused. But I got distracted. I started working full-time at the beginning of 2007 and my attention wavered. I thought of 1,000,006 (approximately) reasons why not to write the book. I mumbled a lot about working on it after getting home from work and on weekends, when I imagined (entirely unreasonably of course) my friends to be sipping margaritas and partying without me. Then I wrote the book. It took a long time for a short book, but I finished it. The thing is, I never would have written that book if I hadn't given that talk. Since 2007, I realized I had enough experience, services, products, and almost Pollyanna-like dogged determination to maybe one day pursue gardening full-time, at least for a while, to see where it might lead me. I started saving large amounts of my salary that year. Having barely gotten by on part-time income for a few years, it was not hard to save the extra I was making now. By late last year, I had enough money to get me by, whatever else happens, for a year. Still I hemmed and hawed and hesitated because, as I'm sure you've noticed, the economy has taken a nose dive. And I've never not worked a "real" job. I've always earned enough money to support myself. I was scared. For about a month, I had little panic attacks daily. So I looked at things on paper, doing the math. I did the math again. I added contingencies. I added emergencies. Surprisingly, the numbers still held. I did them yet again just to be sure, what with being a writer and all (we're not so great with numbers!). They held. So I packed my parachute, put on my rig, and, heart beating terribly, I handed in my notice on groundhog day. My last day was today, Friday the 13th. All week I've had a sense of calm and quiet resolve. This is something I've wanted to do, and knew I had to do, for a very long time. And now that I've jumped, it feels calmingly right. I'm just hoping my parachute will open! Please send good thoughts my direction, and if you have any quotes or pithy thoughts, please let me know! Monica, I made the same TERRIFYING decision a few years ago, and it was perhaps the best decision of my life; I left a career that I did very well in, but had zero lasting interest for me. I came to the realization that my gardening passion was never going to be complete without my full attention. The first year was definitely challenging, mostly financially, and picking up odd things like bartending for a caterer was a great help. You must just follow your heart and let people see your passion! Never become complacent and compromise your dreams. It will all work out for the best and soon you'll see what a pleasure it is to jump out of bed every day to go to do a job you LOVE! We're cheering for you in Georgia! I AM SO HAPPY FOR YOU!!! I am doing the same thing-without resigning the job. Gee-what A BIG leap of faith! The airplane pic is perfect. You will be fine and will love what you do. How much better does it get? Monica, first let me say you can never go wrong listening to what chocolate has to say. But seriously, your excitement is just oozing out of your post today. I know it is a huge leap of faith, but I just don't think you can ever go wrong following your passion. I had a professor that always said to do what you are passionate about, and the money will follow. I am excited for you, and look forward to hearing the continuing adventures of the Garden Faerie. Don't look, Baby--just leap! Monica, I am so terribly proud of you. It does take a lot of courage to follow one's dreams. I am a firm believer in "God doesn't shut one door with out opening another." It is sometimes hard to see the open door but it is there. I wish you all the best in your new venture. I'm sure there will be bad times, but the good times will see you through. That leap of faith is the first step to realizing all your dreams. Monica..we don't know each other really, but your story struck a chord with me. I really applaud that you really 'listened' to your inner self and I think that is so important. I always like my teaching job and I had to leave due to illness which was later diagnosed as multiple sclerosis. Long story, but I am not well enough to work and I got very depressed about it. It wasn't until I started volunteering to help parents with special needs students that I found something I really loved. I wasn't paid, but it didn't matter and I did it for 10 year. Isn't it funny how those Dove promises sometimes hit the mark? You have my support. Keep us posted!! Hooray for you! I can identify with you although I'll probably stick out my job until I can retire. Then I'd love to work as a garden designer, writer and photographer. I wish you the best of luck. I think you are going to be really happy with your decision. Monica, What a great and scary leap. I am very impressed that you planned and prepared for your change in occupation. I am sure you will do well with that kind of preparation and inspiration. Good morning Monica! Oh boy how I can relate to just about everything you express in this post! The day we spent together last summer at the botanical garden gave us such a nice opportunity to get to know each other, so I can't say I'm surprised by your leap. You've chosen many wise steps in your journey of a thousand miles already that will surely contribute to your success. I sure can relate to the fear regarding the economy. I sincerely hope it will ultimately work as a stimulus for garden professionals like us and that home gardening, both ornamental and food gardening will continue to enjoy an increasingly higher profile and greater demand. I don't know if you've noticed the media and garden blog buzz regarding garden coaches/designers/hands-on gardeners offering veggie garden services. It seems to be a growing trend and fits very well into the current economic, environmentally-conscious, and locavore movements. My oldest daughter has many future career dreams in addition to her current teaching career, and one of them is to start a veggie gardening business, offering services from consulting up to and including full-service organic veggie gardening for busy clients. Her services could include harvesting and leaving a regularly-scheduled, freshly-harvested basket of goodies from the client's own organic home veggie garden. She's been in contact with a couple of gardeners who are doing this professionally in their state with more than enough demand to meet their business goals. I will ask her again about them and get their web address. My daughter has communicated with them periodically, and they've been very helpful and generous with their time. I have no doubt that your passion, enthusiasm, planning, and preparation will help ensure the best possible success for your new venture. Congratulations, and I wish you the best of luck and success! There are a lot of articles 'out there' on this subject recently. They've got a great site with lots of information. I know you are going to do great, Monica. I'm a pro, and while design has slowed, people willing to work with do-it-yourselfers have plenty of business. Coaching and consulting are a way to make it through this tough economy and come out ahead - with great relationships with other passionate gardeners, all of whom want to refer you to their friends. If I can help in any way - commiseration from a pro or advice of any kind - drop me a line on my contact form and I'm happy to help. But I know you are going to do great. Passion is 90% of the battle. Monica - I've read this cheering you on as I go! It's marvellous, exciting, scary news! I'm doing the same here myself, though not in such a focused way as you and if I'm loving it I know you will. Having read your story, it's like you've gone through life collecting various pieces of the jigsaw (experiences) and now you're poised to put them all together in just the way you want it. I chuckled when you said you'd thought of all those reasons not to write a book. It's when you find the reason why (and it need be only be one) that you release your self to actually do it. Monica, I am so excited for you! Although I enjoyed teaching--for the most part--I often thought how much more enjoyable it would be to teach part-time. But financial obligations here never made that possible. Now that I'm retired, I'm determined to do what I want and to enjoy life. Gardening has become one constant passion in this new phase of my life. 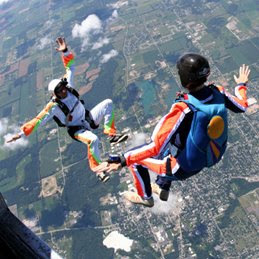 Your parachute is open and it's a rainbow color--your life is now full of possibilities. I wish you much success, but I know you're going to make it! Congratulations on making a big decision. I'm sure it must've been a difficult one. I wish you lots of luck and hope you have lots of success with your gardening dreams!! Good luck on your new venture, Monica. Doing what you love, and making money at it, is a true blessing. Wow Monica - go girl!!! Two years ago I gave up a very safe job in the UK's National Health Service to run my own company doing 3 days per week teaching tai chi in schools and the rest of the time split as I want it to be between gardening and having private reiki and/or reflexology clients in for treatment sessions. I am the happiest, most contented I have ever been. My health is better than it's been for years because I'm not stressed and my relationships have improved because I'm not grumpy and miserable. If your blog is any hint of your skills, you will have queues of people begging you to work for them - just don't under price yourself!! Hold onto your dream, you're on your way - enjoy the ride! well, GOOD FOR YOU!!! Most folks are too afraid to follow their dreams, and then they loose 'em...you, my dear, are one of the lucky few who listen to their own heart and follow their passion....you will do MORE than fine; you will soar!! Best of Luck in your new life and endeavors...GOOD FOR YOU!!! I see a brave and talented woman venturing forward in your well- crafted touching post, Monica. Many hands support your courageous leap. Hello Monica, your story is such an inspiration. Many congrats for taking the leap and making your dream come true! I have been a SAHM for the past 18 yrs and having a garden job is also my dream that I hope to finally follow through. When you love what you do you will never work a day in your life. Thank you all for your wonderful, encouraging comments. Ive been a little, erm, willy nilly lately but this very delayed feedback doesn't reflect how much I appreciated your comments. Tim, This is more a sabbatical to me than a viable long-term career due to financial and physical strength reasons, but I'm definitely glad I leapt! I also wish you good luck in your own garden ventures!! Yes, chocolate is very wise, especially if it's Dove! ;-) I *definitely* need to look forward, not back, that's for sure. I definitely needed to shut the door to my day job, and we'll see where I end up! Yay! I understand depression and how it limits seeing possibilities. I lean toward depression and my job didn't help. In a way I did this to prove to myself I believed in me and to show the Universe I do believe in possibilities and I'm trusting I will find them. I would have had to stay in my job some 20 years more and even then there are no retirement benefits other than what I'd saved myself, so... No point. Good for you, though! This post did make it seem like I planned, and in many ways I did, but I didn't see how things were building on one another until I put this entry together! Thanks for the inspiration and links. It's true people are more interested in gardening, but mostly food gardening, which I know the least about, lol! Also, it's funny how you saw this coming, just based on our one meeting, and many of my close co-workers, who I spoke with the way I did with you, were truly and entirely shocked! My dental hygienist (of all people!) called it a "gap year" which I really liked. That's not really a term we use much here but I know it from England... and as timing has never been my strong suit, I really like the idea of a 43-year-old taking a gap year!! I'm definitely a DIY'er and thanks for offering to provide advice. I'm sure I'll be taking you up on that soon! Thanks for your kind words and I love the puzzle analogy. As I said above for Debbi, I didn't really see how things led to one another, or built on one another, until I actually wrote out this post. It's funny how life is sometimes taking care of you, even though you don't see it at the time. It's so nice to have a spouse who is on the same page with things like this! My ex gave it some lip service but was never truly on board. And the ironic thing is, if I had remained married to him, *I'd* still be working a day job, too, because we'd still have a house way to big for us! I'm fairly independent and live well on my own, and, entirely frankly, don't know many married couples who inspire confidence in marriage, so it's nice hearing about couples who are on the same page. That makes me feel hopeful in an area of my life that I have entirely closed off for the past six or so years. I will have to go back to a "real" job in about a year. I don't foresee my income from various gardening pursuits being able to support me long-term, and the reality is, I don't have a partner also bringing in money. My 401k took a huge dip, I have no pension, social security is predicted to run out the EXACT year I'd retire, and my dad died before he could retire... all this pressed upon me the desire to get in at least a year of retirement NOW. P.S. I fondly remember "What color is your parachute"! Thank you for your well wishes and I hope to enjoy this time! Thanks for your good thoughts. All the good wishes make for "good air" in leaping! I don't think I'm an inspiration, I just think I'm someone fighting very hard to live my own kind of life, which has never been so easy! Good for you! My job was also every safe, but also very frustrating and draining. I wish we had national health insurance in the U.S.; the need for it keeps many, many people at jobs they dislike. My coverage runs out Sunday and I'm paranoid something bad will happen! This is one of my biggest fears, in fact. Thank you for your kind words. I have misgivings and doubts every day but I still know this is the right thing for me to do! I love the quote, and that's always how I've lived my life, or tried to, anyway. That's one reason I know I had to leave my job. Effort was not rewarded and I was drained and no longer giving my best... and that's not a good match for who I am. Thanks for stopping by and I hope your own gardening dreams soon come true. It looks like you live in the right place for that! You know, I've had jobs were levity and "play" were encouraged, but that was not the case for my last one. I feel I'm still "detoxing" but I hope to get my spark back some day! Monica, I can't believe I missed this important post! Friday the 13th is such a cool day to leave work. ; ) That's the day Chilli got spayed, maybe therefore I missed it. Anyway, I had to tell you how much I loved getting to know a little bit of your way so far. Loosing your father at 31 is pretty tough. My mom had breast cancer 1,5 years ago, she went through chemo and everything. She survived it but you know what kind of illness cancer is. Scary. Then your divorce, the next big step. And then all the little steps that brought you to where you are today. Everything out of your own motivation, your own strength! Great! I hope this sabbatical will not only be a superb experience, but bring you closer to your dreams!!! You are already a winner for trying. Monica, thanks for stopping by my blog, and in answer to your question - we cut back Buddleia too, but I usually only go about a foot from the ground. About 15 years ago I lost a job during an ownership transfer. I could have continued doing what I had been doing, or do something I love. I decided to take the opportunity and change careers and started as a sales person at a garden center. Now I teach classes, write gardening newsletters, buys plants using other peoples money and appear weekly as a "garden expert" on local TV. I am sure you have made the right decision in changing your vocation to an avocation. Wishing you a very happy and soft landing on fragrant cushions of thyme and catnip, Monika, after this brave leap of yours. BTW how you got ambushed into teaching and speaking in public sounds very much like how I got sneakered into it. With me it was my hobby of catbreeding that openened those scary doors for me. Scary because I'm shy but hey, not batting an eyelid now when I have to talk in front of thousands of people. We live and learn. How wonderful that you took such a big step. I wish I had done the same but am now enjoying trying to tame 5 acres of rather boggy land in Ireland. I have gardened all my life and love your blog.